Brought by the hand of God to the prairie | Walk with us! It is impossible to see all of South Dakota in a few days. South Dakota is a very large state, and it has many natural wonders. There is much to see and to do. Most visitors only choose three or four places to visit, namely Mount Rushmore, the Badlands, the Black Hills, and the Crazy Horse monument. One must choose to see South Dakota, it isn’t on the way to many places. It takes approximately 12 hours to get to Lower Brule by car from Sacred Heart Monastery in Hales Corners, Wis. Or, you can fly to the state’s largest city, Sioux Falls, from which you can rent a car and drive the 170 miles to Lower Brule. After getting off I-90 at Exit 248 to Lower Brule, if it is a clear day, you will see the highest hill called Medicine Butte situated just eight miles from Lower Brule. When I drive in South Dakota, I immerse myself in the vast, sweeping prairies of The Great Places and the Great Faces. I am warmly welcomed by a place of endless educational opportunities and unforgettable experiences. Anytime I drive to visit one of our six parishes on the west and east banks of the Missouri I can feel prairie winds through the valley breaks and broad river terrace of the Native American reservations. The great Missouri runs through the vast grasslands which extend west over east to the horizon. In my opinion, the Brule Reservation is rich in natural life. Antelope, mule, deer, and buffalo roam freely. There are also prairie dogs scattered across the uplands and valleys. Pheasants, wild turkeys, and many kinds of birds are abundant. What can I say about pastoral ministry in Lower Brule? As with any place, pastoral ministries are done with a local flavor: the sacrament of reconciliation, the Eucharist, the liturgy of the Word, etc. Also as in many places, fewer people go to Mass and confession these days. This is an unfortunate development because private confession is one of the pillars of the spiritual life. It is said that God is not tied to one vehicle as a highway for the forgiveness of sins. However, the sacrament of confession is still important for adult Christians as they grow spiritually. Sometimes I listen to the stories of villagers after Mass. At times they have struggled to integrate their Native American culture with their Catholic faith. In many instances, both traditions have been passed down by their families. When the Native Americans come to powwow, they talk about Native American culture which is expressed in many symbols, songs, and dances. They hold it firmly and closely as a jewel. Whenever I reflect on my own inner journey I realize what a gift it is to be a Dehonian missionary, to learn first-hand about other people by being with them. 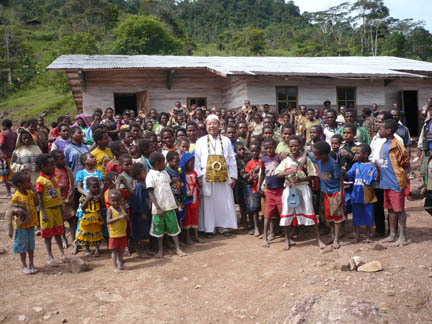 In reflecting on my pastoral ministry in Lower Brule, many questions fill my mind because I am a new person in this area. I have much to learn. If I truly live in the mission spirit and in the spirit of Sacred Heart, I will let myself be used by God to bring hope, love, and mercy to the people with whom I am ministering.